iPhone and iPad Repairs Made Impossible For Third Party Repairers By "Error 53"
Reports have been speculating that the infamous "Error 53" could be a ploy by Apple to squash the burgeoning iPhone and iPad repairs industry. Owners of the more recent versions of the iPhone and iPad have been reporting the "error 53" issues since 2014. Error 53 seems to arise for users when they damage their Touch ID sensor. Prior to repair, iPhone and iPad users try to back up their data which will be deleted during third party repairs. 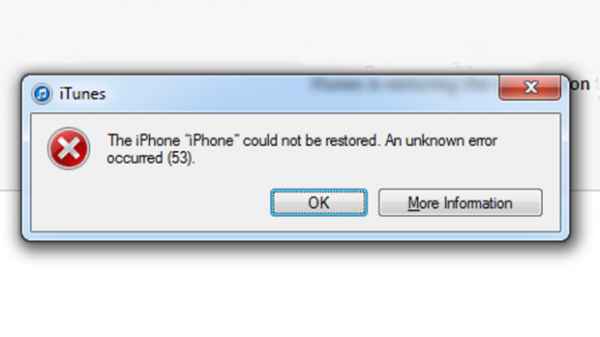 This is when many users see the "error 53" message, which states that the iPhone or iPad can not be restored due to "unknown error 53." The iPhone and iPad then reportedly shuts down, and deletes all the devices data permanently. Reports also show that "error 53" causes the iPhone or iPad to stop working completely. There are speculations that Apple are using "error 53" to limit the flourishing iPhone and iPad repairs industry. Some experts think Apple could be using this error to make it necessary for all iPhone and iPad users to repair their devices through Apple rather than any third party repairers. Reports speculate the "error 53" could be a ploy by Apple to diminish iPhone and iPad repairs industry. Error 53 seems to only arise when the Touch ID sensor is damaged. The Touch ID sensor is relatively new feature that is used only in the more recent iPhone and iPad models. Error 53 seems to suggest that these Touch ID sensors have been cryptographically secured by Apple during manufacturing. This eliminates the possibility of third party repair stores being able to sufficiently repair the iPhone or iPad when this error occurs. This error has resulted in an investigation against Apple by the Australian Consumer and Competition Commission (ACCC). ACCC are said to be investigating whether or not a "security measure" that turns a thousand dollar product obsolete is a violation of consumer rights. Apple has come under criticism many times before for making their products notoriously difficult for third party repairers to repair. Could this "error 53" be a ploy to increase Apple repair business and diminish the flourishing iPhone and iPad repairs industry?